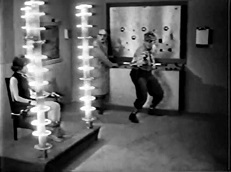 A Nazi scientist (Jack Herman) invents a time machine, enabling him to go back in time to alter the events of WWII. Also stars Tim Holt and James Britton. Also with Ann Pellegrino, Robert Bob Kelly, Linda Jenkins and Bill Thurman. NOTE: The picture quality for this film is very nice and far superior to that of the factory DVD, which is also being offered here at SSV.